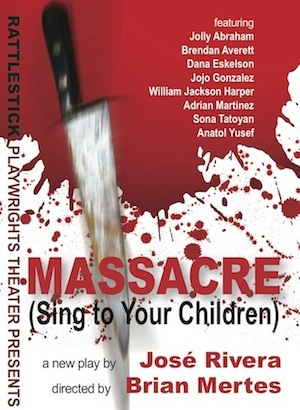 We enter the world of Massacre (or the characters of Massacre enter our world) in a rush of sound, noise, blood, animal masks, and weapons from a childhood horror movie — knives and machetes and bats rather than guns. Our seven screaming characters have clearly just done or witnessed something horrific, and over the next two acts we unpack the nature of their relationships to one another and to an eighth character who may or may not exist outside the door of the basement/outbuilding/rustic forest shower room that comprises our set. There has or has not been a killing, there has or has not been a five-year reign of terror, there has or has not been complicity of our characters in their own persecution. What there is here is horrifying and spectacularly visceral storytelling. There is a delicious purity to this piece, full of realism and symbolism and ready to be interpreted in myriad ways. Outside of the fact that I basically agree with your review [saw the show the night before opening], I thought your review was itself well written. I would add the ensemble acting is quite good and production values first rate. Loved the sound utilized.